A Northern Circuit. 13 miles approx. time. In fact, it was a sunny wind-free day, with the Meadows thermometer showing eleven degrees. Not bad for late February. 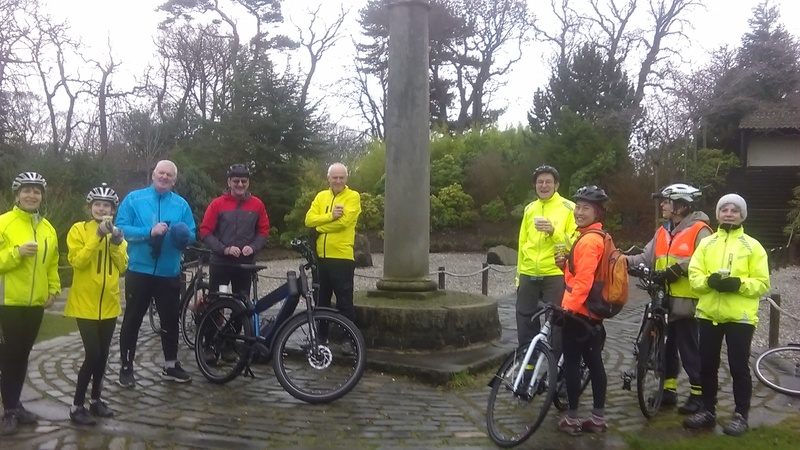 Five of us set out for a tour of north Edinburgh parks and bike paths. We started by whizzing down the main road through Holyrood Park: a nice downhill run on a car-free road. We left the park by Sunnybank Place, then headed along Marionville Road and into Lochend Park. doocot served as a kiln for burning the victims’ clothing and bedding. On leaving the park, we joined the Restalrig Path as it curves through Seafield towards Leith Links. We continued across Constitution Street and into the old part of Leith. In Burgess Street we paused to look at Lamb’s House. This early 17th-Century merchant’s house has been restored to its former glory by architects Kristin Hannesdottir and Nick Groves-Raines, who now occupy the premises. Ms Hannesdottir is also the Icelandic consul, which explains why that country’s flag was flying in front of the building. teeming with cyclists, children and dog-walkers, all enjoying the unusual February weather. work (actually not all that hard) as we ascended Carrington Road and Craigleith Hill Avenue to join the Roseburn Path at Craigleith. 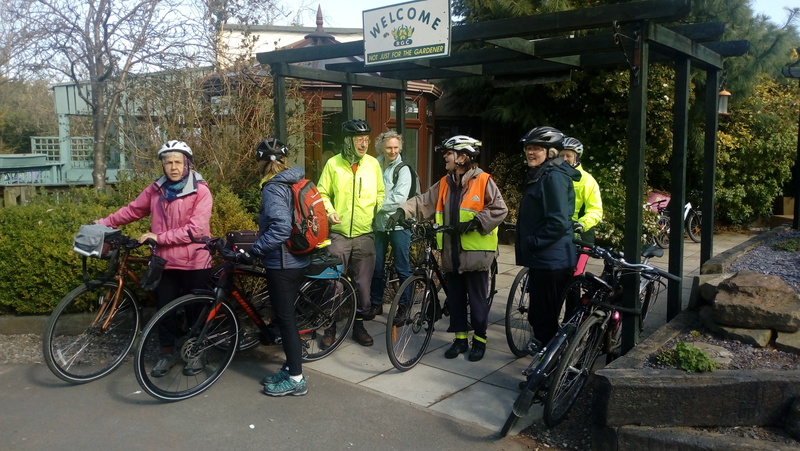 We then headed south to the Russell Road zigzags, then on to Murieston Crescent, the Telfer Subway, the Leamington Lift Bridge and the short climb up Leamington Terrace to Brunstsfield. The final leg saw us crossing Bruntsfield Links to reach Middle Meadow Walk a little after 12.30. The total distance was 13 miles – just about right for a pleasant Sunday morning’s ride. 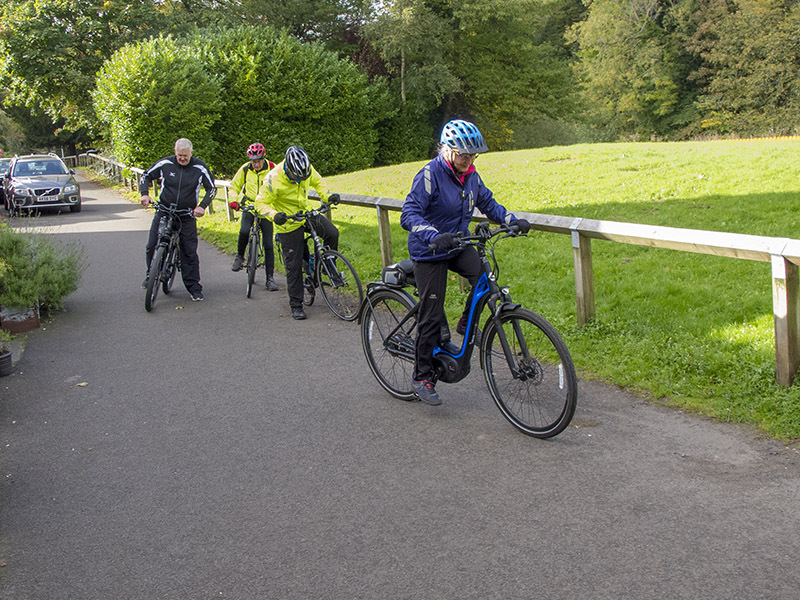 Next month we put the clocks forward, and EasyCycle will revert to its summer programme of slightly longer rides including a pub or café stop for lunch. See you then. Japanese Jaunt. 15 miles approx. A respectable 10 turned out for todays 2018 Easy Cycle finale, including (to the best of the writers knowledge) 5 first timers. The original plan for the route for this ride was discarded on the grounds it involved a long muddy path, busy with festive holidaymakers, so we ‘agreed’ to visit the Kyoto Japanese Garden instead – hence the title of this report. 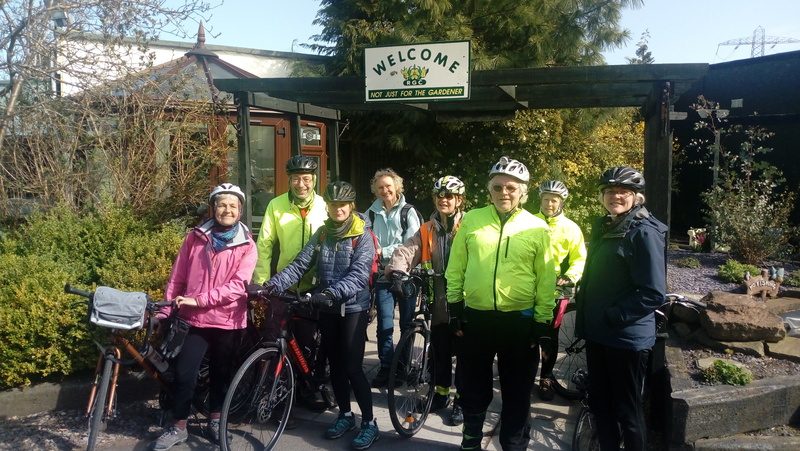 As is normal, we mustered at Soderberg cafe, before setting off down Middle Meadow Walk, Bruntsfield and Leamington Lift Bridge, where we spotted a submerged ‘barge’, or canal boat as the writer was corrected by an owner on the ride. Onwards down the Fountain Park bumps, Russell Road zigzags and we were on the cycleway destined for Silverknowes and Lauriston Castle beyond. In the grounds of the castle lies the Kyoto Garden http://www.edinburghspotlight.com/2010/05/review-edinburgh-kyoto-friendship-garden-2/, where we had a stop to enjoy some warm mulled wine, biscuits and nuts. 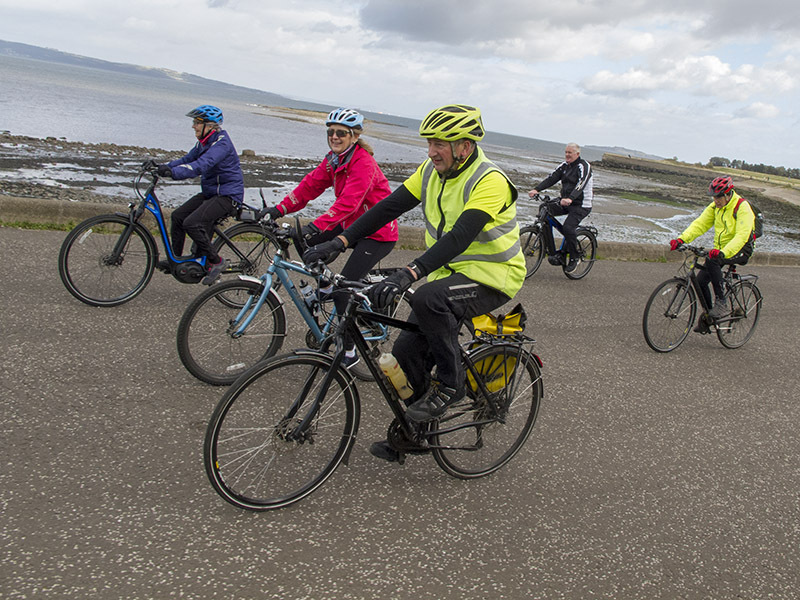 Cycling along the front of the grounds revealed a spectacular seascape of the Forth, Cramond Island to the fore and the Kingdom of Fife in the background, with its locally dubbed ‘Fifel Tower’ mast in clear view. Leaving the castle, we traversed a muddy section through the woods at Davidson’s Mains and crossed the busy Queensferry Road into Clermiston. After pedalling along Clermiston Drive and a right into Drumbrae Crescent, we had views of the Forth Bridges, three adjacent bridges which were built in three different centuries. Passing Drumbrae Leisure Centre we crossed into the warren of paths in East Craigs. Skirting the side of Craigmount High School, we negotiated the obstacle presented by a small flight of steps without any problems. Over Glasgow Road, we were in Gyle Park, along Dovecot Road, where we noted the architecture of the eponymous ‘Doo’cot’ being somewhat at odds with the surrounding domestic residences. Soon we were on the old Pinkhill line and back past Murrayfield Stadium, which led us on to Russell Road, where we retraced our earlier route back to the top of Middle Meadow Walk. The Doctors pub was busy, so we chose to have our post ride refreshments at Thomas J Walls (The Optician’s) cafe. (The visits to The Doctors and The Opticians obviously not for ill-health reasons!). All in all, a good days cycling, in great company, to round off the year. Roll on 2019! 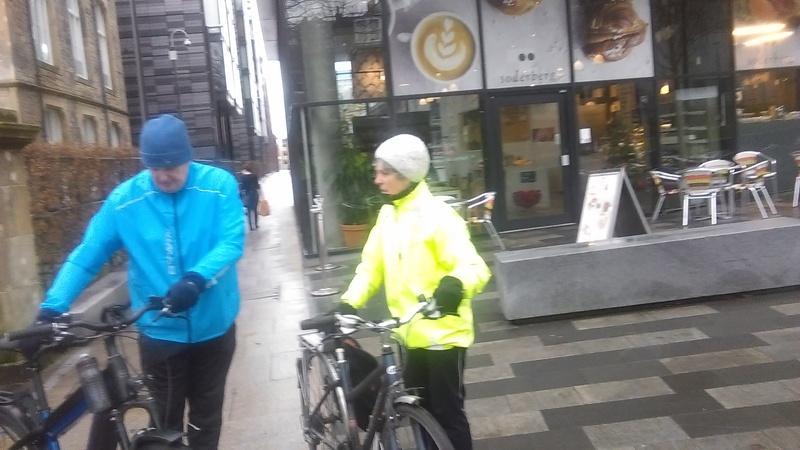 Mike bravely led a ride in diabolical weather – Heavy rain. only two riders turned up. With the clock turned back an hour, we set off from the Meadows taking the Innocent Path to Brunstane, through the Gilbertstouns to Newcraighall. There were 11 of us – a very cheery group. Everyone appeared to be delighted to be out on such a sunny Autumn day. Having admired the memorial to the local mining community, we headed up to Queen Margaret University and took a pleasant detour through their parkland to see the lochan and ducks. 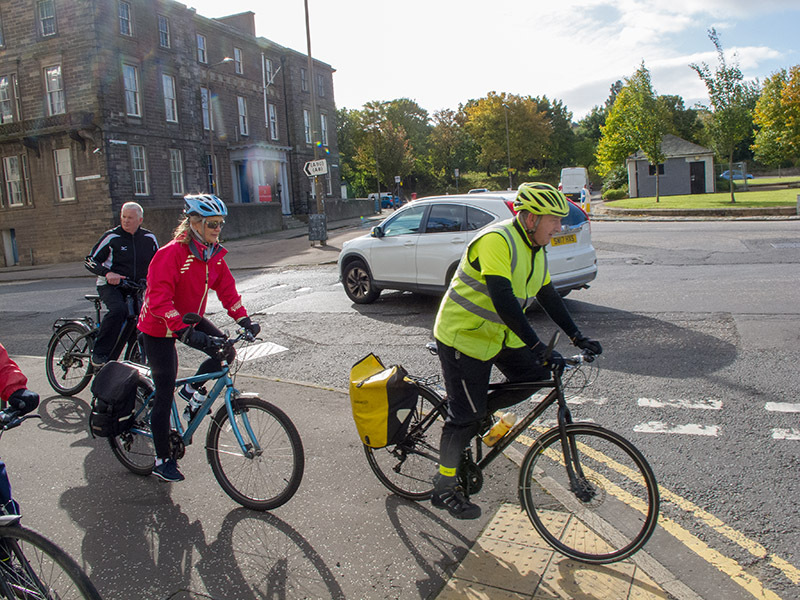 At Musselburgh Station, we took the off-road path alongside the railway line down to Newhailes Road and entered the Newhailes estate. After a short look at Newhailes House and the stables we rode past the Doocot, the new adventures playground, the curling pool site, the Shell Grotto and the old Summer Tea House. Leaving the estate we took the Brunstane Burn Path and Brunstane Road to Portobello Prom to have lunch which had been booked at ESPY. It was very good. 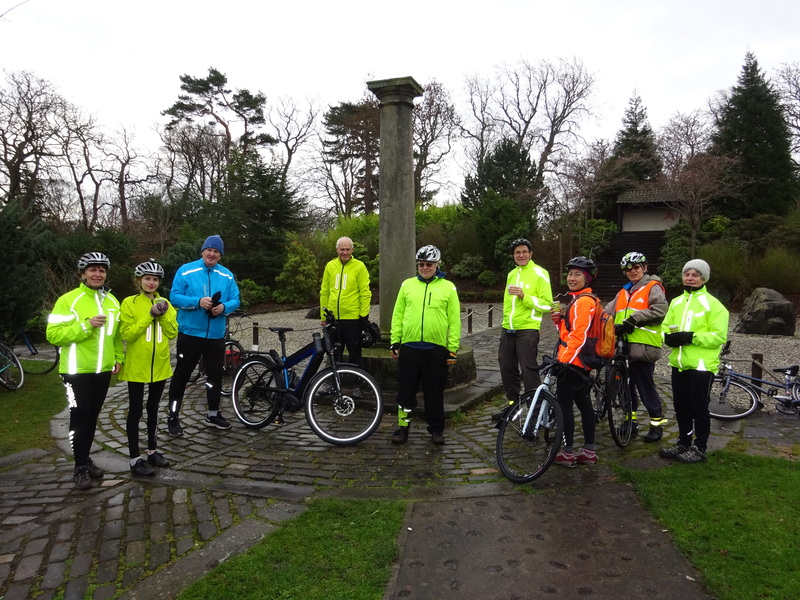 We set of home via Bellfield Road, St Mark’s Place, Hope Lane and Porty Golf Course – going through Figgate Park and Duddingston. Total distance: 15 miles. The forecast was for heavy rain and a chill (12 deg). At least, a chill for us because we have been spoiled by a hot summer.